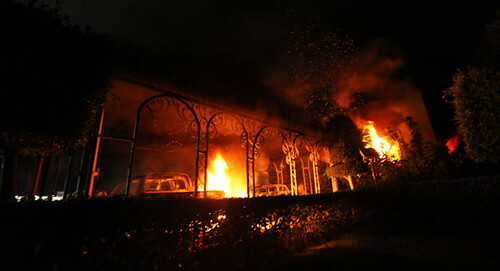 US consulate in Benghazi, Libya which was destroyed by people angry over the role of the United States inside the country. Demonstrations were held at the same time in Egypt, Sudan and Tunisia., a photo by Pan-African News Wire File Photos on Flickr. The report found that the deadly attack was fueled by anger over an anti-Islam U.S.-made video. A lengthy New York Times investigation of the deadly 2012 attack on the U.S diplomatic compound in Benghazi, Libya, found no involvement by al-Qaeda or other international terrorists groups and was accelerated in part by anger at a U.S.-made video denigrating Islam. The attack left four Americans dead, including U.S. Ambassador Christopher Stevens. The six-part report on the investigation is written by David D. Kirkpatrick and was posted Saturday on the Times' website. It centers on extensive interviews with Libyans in Benghazi who, the newspaper says, had direct knowledge of the attack and its context. "The attack does not appear to have been meticulously planned, but neither was it spontaneous or without warning signs," the Times concludes. The newspaper notes that Republicans have argued that the Obama administration was trying to cover up al-Qaeda's alleged role in the attack. "It was very clear to the individuals on the ground that this was an al-Qaeda-led event," Rep, Mike Rogers, R-Mich., who is chairman of the House Intelligence Committee, said last month on Fox News. "But the Republican arguments appear to conflate purely local extremist organizations like Ansar al-Shariah with Al Qaeda's international terrorist network," the Times report says. "The only intelligence connecting Al Qaeda to the attack was an intercepted phone call that night from a participant in the first wave of the attack to a friend in another African country who had ties to members of Al Qaeda, according to several officials briefed on the call. But when the friend heard the attacker's boasts, he sounded astonished, the officials said, suggesting he had no prior knowledge of the assault." The newspaper says that a fuller account of the Benghazi attacks "suggests lessons for the United States that go well beyond Libya." "It shows the risks of expecting American aid in a time of desperation to buy durable loyalty, and the difficulty of discerning friends from allies of convenience in a culture shaped by decades of anti-Western sentiment," the Times investigation says. "Both challenges now hang over the American involvement in Syria's civil conflict." The Times says a central figure in the attack was an eccentric, malcontent local militia leader, Ahmed Abu Khattala. It says U.S. officials briefed on an American criminal investigation into the killings call him a prime suspect. The report says Abu Khattala had no known affiliations with terrorist groups, and had escaped scrutiny from the 20-person CIA station in Benghazi that was set up to monitor local conditions. Abu Khattala denied to the newspaper that he participated in the attack, but the newspaper says he was "firmly embedded in the network of Benghazi militias before and afterward." The Times report on the attack itself says the U.S. compound had been under surveillance at least 12 hours before the assault started. "The violence, though, also had spontaneous elements," the Times writes. "Anger at the (anti-Islam) video motivated the initial attack." The video, titled "Innocence of Muslims" was made by an American, but had appeared almost exclusively only online, on YouTube. It had also prompted protests for hours the day before at the U.S. Embassy in Cairo. "Dozens of people (in Benghazi) joined in, some of them provoked by the video and others responding to fast-spreading false rumors that guards inside the American compound had shot Libyan protesters," The Times writes. "Looters and arsonists, without any sign of a plan, were the ones who ravaged the compound after the initial attack, according to more than a dozen Libyan witnesses as well as many American officials who have viewed the footage from security cameras." The Times says Abu Khattala, who still freely moves around the area, suggested that the video insulting the Prophet Mohammed might well have justified the killing of four Americans. "From a religious point of view, it is hard to say whether it is good or bad," he told the newspaper.